This map shows the extreme volcanic nature of the Campi Flegrei. This area was the home port for the Western Imperial Fleet. Besides the bay, itself, other smaller bodies of water were important as training facilities. (These are circled in red.) 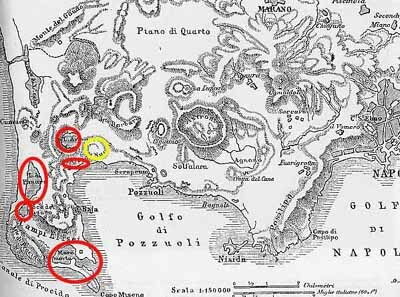 Since this map is from the last 500 years, however, there is an interesting anachronism: the yellow circle shows Monte Nuovo, a recent appearance in the 1500s. The eruption that formed that small mountain effectively destroyed --or, at least made a lot smaller-- the adjacent Lake Lucrino, which, at the time of the Romans, was a large training lake.